This German edition of The Blessing Way is a re-issue of the 1972 translation by Gisela Stege also published by Rowohlt (Hieb, 1990: A1f). This edition however was released in paperback. The cover bears the marking, "Neuauflage des lange" (New Edition), however the content appears to be the same as the 1972 edition. Binding: Paper covers with black-and-white photograph. 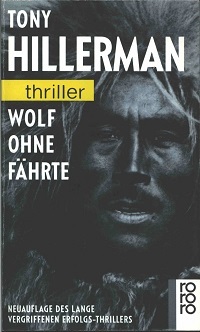 Text in white, with short band of yellow highlighting the word "thriller."